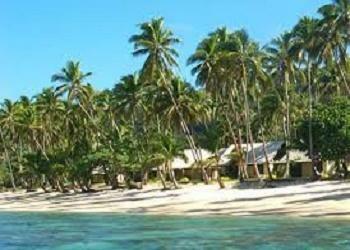 Holiday makers to Fiji will find that the Tambua Sands Beach Resort is an affordable boutique resort that is ideally positioned amoungst 17 acres of coconut palms and lush tropical gardens. Situated on Fiji's Coral Coast the Tambua Sands Beach Resort is edged by a white sand beach, crystal-clear lagoon and coral reef. The property provides a peaceful atmosphere and is the perfect setting for a relaxing Fiji holiday. The Tambua Sands Resort has fully air-conditioned bure accommodation, with a choice of beachfront or garden rooms which are all generously spaced within the 17-acre gardens. All bures further provide fans, comfortable bedding, private ensuite bathroom with hairdryer and free toiletries, room safe, free cable TV, desk, mini bar, coffee/tea making facilities, ironing facilities and private patio area with wonderful views. Guests staying at the Tambua Sands Resort can laze around the resort fresh water swimming pool, take a dip in the warm Pacific waters or explore the Coral Coast with a variety of attractions from trekking to the spectacular cave near Tau village, fishing, canoeing, golfing, snorkelling and diving, to tours to historic sites. Further guest facilities and services include a bar, a-la-carte restaurant, lobby lounge, gift shop, concierge, direct beach access, entertainment staff, non-motorised water sports, 24-hour front desk, BBQ facilities, daily housekeping, massage, security, free on-site car parking, croquette, babysitting services, room service, tour desk, luggage storage and airport shuttle. Every night at the Tambua Sands Resort there are island theme nights that show case the traditional kava ceremony, pottery and weaving demos, Polynesian shows and traditional Fijian singing and dancing. Located in beautiful Korolevi, Fiji, 70 miles from the capital city of Suva the Tambua Sands Beach Resort is an resort with a wind-swept beach and radiant sunsets that you can admire each evening. Guests staying at this property can enjoy swimming, snorkeling and kayaking in the clear-blue lagoon and coral reef, laze on the white sand beach, play the beautiful 9-hole golf course, make use of the tennis courts, enjoy fishing charters, sunset cruises and live entertainment at the sister properties. Alternatively you can head out and explore the Sigatoka Sand Dunes National Park, the Kula Eco Park and Waterfall. Tambua Sands Resort Address : P.O Box 100, Korolevu, Sigatoka.